the power of electronic engine control into the tuner’s hands. It’s not just data squirted into your car, it’s a fully functional computer working seamlessly with your car’s engine management system. In bygone days, “tuning” engines meant mechanically altering timing and fueling… rotate the distributor body and change the jets. Tuning was relatively simple, required only basic shop tools, and “tuners” popped up everywhere to feed the need for speed. Unfortunately, as OEM engine management became progressively more sophisticated, and the factory computers controlling the engine became correspondingly more impenetrable, “tuners” became “installers” and many simply disappeared altogether. The Unichip changes that.. The power of the Unichip also means universality because its extremely open architecture allows it to be integrated with virtually any electronic engine management system which means you’ll find Unichips on virtually any sort of vehicle. In our Plug ‘n Play kits, the Unichips are specifically tailored not only to a particular vehicle model, but also precisely calibrated for the most popular aftermarket bolt-on’s like cold air intakes and exhaust systems. 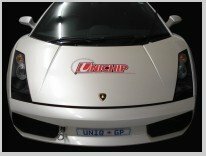 You’ll also find Unichips in 47 countries, giving Unichip Custom Tuners the power to manage virtually anything on virtually any engine. Manufacturers of aftermarket kits such as bolt-on turbochargers, superchargers, or even fuel-saving devices rely on its ease of fitment, reliability, and level of control. The Unichip is the universal tuning chip.